Zoe Holmes, Senior Travel Consultant at our Colchester travel agents, took an amazing trip to the Las Vegas Strip. During her time away, she visited some of the many famous hotels available and even got the chance to experience a show or two. We flew from Gatwick with Norwegian Air on board a brand new Dreamliner, so the aircraft was immaculate. I felt comfortable in economy and the crew were well presented and provided a very good service. Norwegian Air doesn't have the normal cabin service when it comes to food and drinks, so you must make customers aware that they will have to purchase everything - even a blanket if they are cold. We had pre-purchased meals but if you want a drink, further snacks or headphones, you have to purchase this using their online snack service on the seat back TV. They are a cashless airline, so you order what you want and just swipe your credit card and they deliver it to your seat. It was a very good system that worked well. We stayed at the Encore at the Wynn for our first two nights. My first impressions were....'Wow'! We were due to stay at the Wynn but were upgraded to suites at the Encore. I will never forget the moment I went into my room - the lights came on and the curtains drew back to the most amazing view of the Las Vegas strip. I loved the Wynn and the Encore; they are both very classy hotels with a more intimate atmosphere. The Encore's suites have floor-to-ceiling windows and oversized bathrooms, whilst both hotels offer every conceivable luxury from designer brand shops and boutiques in the shopping arcade to pools with private cabanas available for rent and world class dining. The Wynn and the Encore are located towards one end of the strip so they offer amazing views. I would recommend this hotel to anyone looking for a luxurious and classy Las Vegas experience. Our last two nights were spent at the Cosmopolitan Hotel. This is a very hip and trendy hotel with a lively atmosphere and younger clientele, making it popular with groups. The accommodation is very contemporary and has excellent facilities - a whole floor just for dining (including a secret pizzeria). The hotel has a very cool vibe and the public areas are vast, making it a very different Las Vegas experience to some of the more classic hotels. The rooms are extremely spacious and almost have a residential feel about them. The Terrace Studios we stayed in had an oversized private balcony – the only balconies in the whole of Las Vegas. It has a prime location in the CityCenter development and is very sophisticated. I would highly recommend it for those looking for a lively yet luxury property. 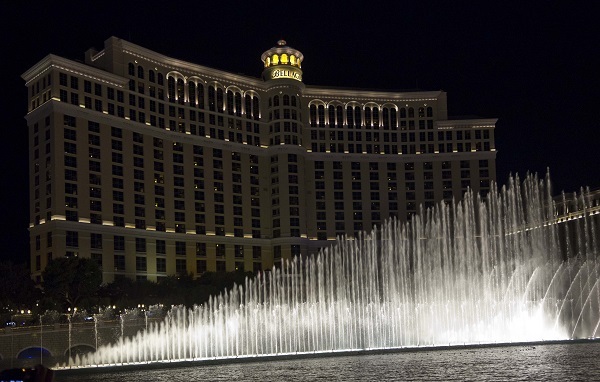 The Bellagio - Beautiful elegant property, located in the heart of the strip and, of course, you can't forget the famous fountains. Top tip - be sure to have a strawberry Bellini in the Hyde bar overlooking the fountains. It’s a bit pricey but well worth the view. Next stop was the new CityCenter development to see the Vdara and Aria. The Vdara is a non-gaming, non-smoking, boutique hotel. It’s very classy, relaxing and is an all-suite hotel offering a different Las Vegas experience. The spacious suites provide luxury accommodation, including a fully-equipped kitchen. Having a fantastic location, it offers access to the excitement of the strip while providing a tranquil retreat from it all at the end of the day. The Aria Resort & Casino is at the heart of CityCenter and offers spectacular amenities. I would recommend this hotel to any 'foodies' as it has an extensive selection of dining options and some of the world's most acclaimed chefs and restauranteurs. The hotel has more than 4000 luxurious, contemporary rooms with floor-to-ceiling windows offering amazing views. 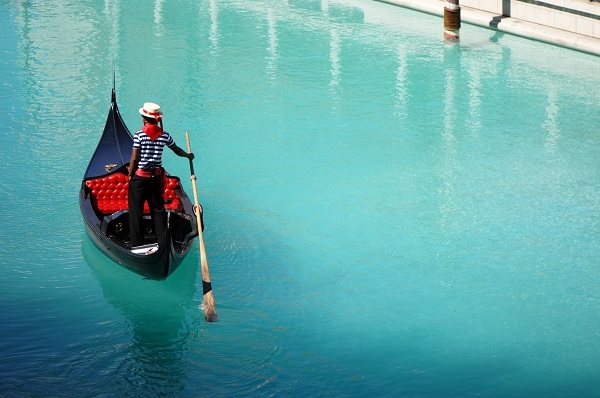 The Venetian is a stunning all-suite hotel with an authentic Italian charm. I loved the Grand Canal shops, promenades and the Gondola rides; it is a truly magnificent setting. The Palazzo Resort is just steps away with high-end shopping, fine dining and sleek modern suites that include a sunken living room. Everything at the Palazzo is pure luxury and the highest quality. The Planet Hollywood is an exciting, lively hotel that’s centrally located on the strip and offers three acres of casino entertainment. Here you will find Gordon Ramsey's BurGR Restaurant (always a queue for a table). Britney Spears was performing at the AXIS Theatre here during our stay and the acts are constantly changing. The theatre offers the most cutting-edge pop concert experience ever produced for Vegas. The rooms are funky and each one has its own piece of Hollywood history. Make sure you visit the amazing array of shops in the Miracle Mile too. The Paris pleasantly surprised me. It is in a great location, opposite the Bellagio, and has a mix of modern accommodation with French-inspired decor. It’s a good choice for couples or honeymooners looking for gourmet restaurants and premier service. The Cromwell is the first stand-alone, upscale boutique hotel in Las Vegas. This is a very sophisticated hotel with a blend of both modern and vintage design. With only 188 rooms, it offers a very intimate atmosphere and gives guests a VIP luxury experience. Caesars Palace is one of the largest and most iconic hotels on the strip. Classic Roman-themed decor makes this hotel a favourite with all guests. Most of the rooms have been recently refurbished and the hotel has eight swimming pools. 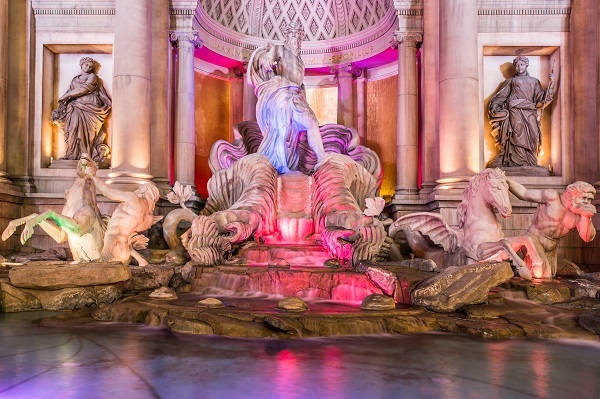 Caesars is home to the Colosseum, which hosts mega stars such as Celine Dion and Elton John. The Nobu Hotel is situated in a separate tower within the famous Caesars Palace hotel. With Japanese-inspired decor mixed with sleek modern touches, guests will feel miles away from Vegas. In-room dining is from the Nobu Restaurant and Nobu guests also have access to priority seating if they choose to venture downstairs. This performance has been voted "Best Production Show" in Las Vegas for an unprecedented six consecutive years. It takes place on a circular stage which changes between being submerged beneath the surrounding water and standing high above it like a fountain. La Reve – The Dream features stunning performers and breathtaking aerial feats of strength and agility, fusing diving with dance at every opportunity. It was amazing and a really good alternative to the famous Cirque du Soleil show! Marquee Nightclub and Dayclub is like no other entertainment venue you have ever experienced. Attracting celebrities and partygoers from around the world, it offers a variety of different spaces in which to enjoy the music or simply relax. These include a rooftop patio with views of the Strip; an ultra-pool club; the “Boom Box,” a mixed format room; and “the Library,” a low-key VIP retreat. We were lucky enough to have a helicopter flight over the strip one evening. This was arranged by Maverick and the 15-minute flight was amazing. I would highly recommend this as we had the most exhilarating views of the strip, the famous hotels and the historic Freemont Street, home to the city's first casinos. Vegas Rockstar VIP is Las Vegas's top nightlife and hosting company. Whether you are looking to party in Las Vegas' top nightclubs, dine in famous restaurants, see the shows or simply experience the lights and glamour of the city, Vegas Rockstar VIP can take care of all your needs. We had a club tour one evening, starting at the SLS Resort. The 'party bus' took us to three different clubs, including the popular 'LAX' club at the Luxor. This was great fun and an excellent idea for those looking to party hard. Measuring 520 feet in diameter, the High Roller eclipses both the London Eye and Singapore Flyer. The wheel takes 30 minutes to complete one full revolution and features 28 glass-enclosed cabins with broad views of Las Vegas and the Strip. I loved this and would highly recommend this to people that don't mind heights and want a different perspective of Vegas. The views were absolutely amazing and it was great fun. I loved seeing the amazing hotels and all they have to offer and just taking in the glitz and glamour of the strip. You can't beat watching the beautiful fountains of the Bellagio, especially from the 'Hyde Bar' with a strawberry Bellini in hand. The helicopter trip over the Las Vegas strip had to be my highlight of the trip, though. I loved Vegas so I would recommend this trip to anyone looking for a bit of excitement and adventure. USAirtours offer many hotels to suit all tastes and budgets. It is great for entertainment, shopping, gambling, nightlife or simply relaxing by one of the many pools that the hotels offer. It is also a great opportunity to visit the Grand Canyon. It truly is a unique destination! I had a fantastic time on my fam trip and would like to thank USAirtours and Fred. Olsen Travel for such a wonderful experience. Must see? Take a taxi to the famous 'Welcome to Las Vegas' sign and take a selfie! Must do? 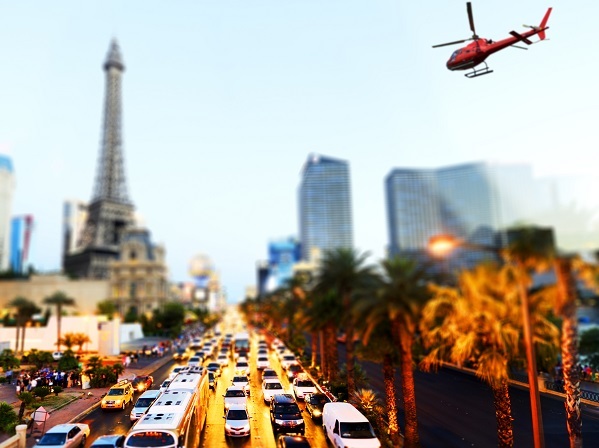 Helicopter down the strip - well worth it for the exhilarating views! Must try? The buffet at the Wynn - the best in Las Vegas. Amazing! If you would like to take a once-in-a-lifetime trip to Las Vegas, the team at Fred. Olsen Travel Agents will be more than happy to help make this a reality. Drop by any of our travel shops in Norfolk, Suffolk, Essex, Hampshire or Dorset.